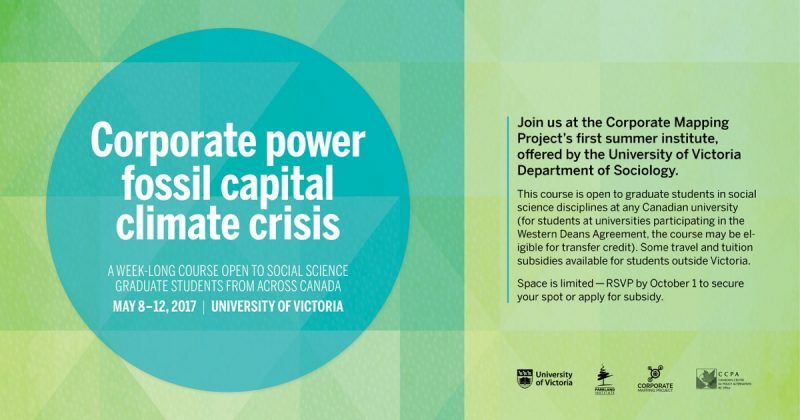 Join us at the Corporate Mapping Project’s first summer institute, offered by the University of Victoria Department of Sociology. 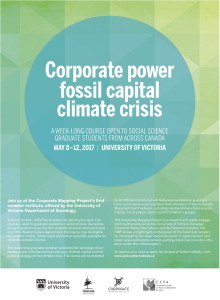 This week-long graduate seminar combines the sociology of corporate power with the political economy of fossil capital and the political ecology of the climate crisis. The course will be directed by Dr. William Carroll, but will feature presentations, guest lectures and extensive participation from members of the Corporate Mapping Project network, including representatives from environmental, social justice, labour, and First Nations groups. The Corporate Mapping Project is a research and public engagement partnership led by the University of Victoria, Canadian Centre for Policy Alternatives and the Parkland Institute. 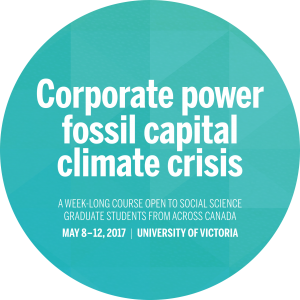 The CMP shines a bright light on the fossil fuel industry by investigating the ways corporate power is organized and exercised. Space is limited—RSVP by October 1 to secure your spot.The course is open to graduate students in social science disciplines at any Canadian university (for students at universities participating in the Western Deans Agreement, the course may be eligible for transfer credit). Some travel and tuition subsidies available for students outside Victoria. Answer the eight short questions here.